Below I have listed a selected limited set of my publications and some presentations I’ve given. 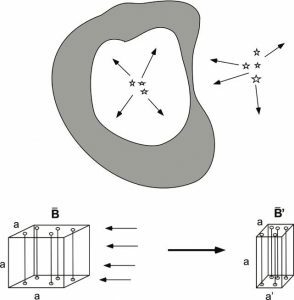 In my first consequential paper on the issue of grain alignment, Steve Potter and I (Andersson & Potter 2007), elaborated on a suggestion by Whittet et al. 2001 and showed that the location of the peak of the visual polarization is universally linearly correlated with the extinction, showing that the color of the light affects which grains are aligned. Interstellar polarization shows a characteristic wavelength dependence which can be parameterized by the maximum polarization (pmax), its wavelength location (λmax) and the K-parameter encoding the width of the curve, exemplified on the left by the polarization curve towards HD 283701. In our 2007 paper we showed that λmax is universally related to the visual extinction of the material meaning that the alignment of the dust grains is related to the color of the illuminating light. Radiative Alignment Torque (RAT) theory predicts that the alignment efficiency for a dust grain will depend on the angle between the incidence of the light causing the alignment and the directions of the magnetic field. 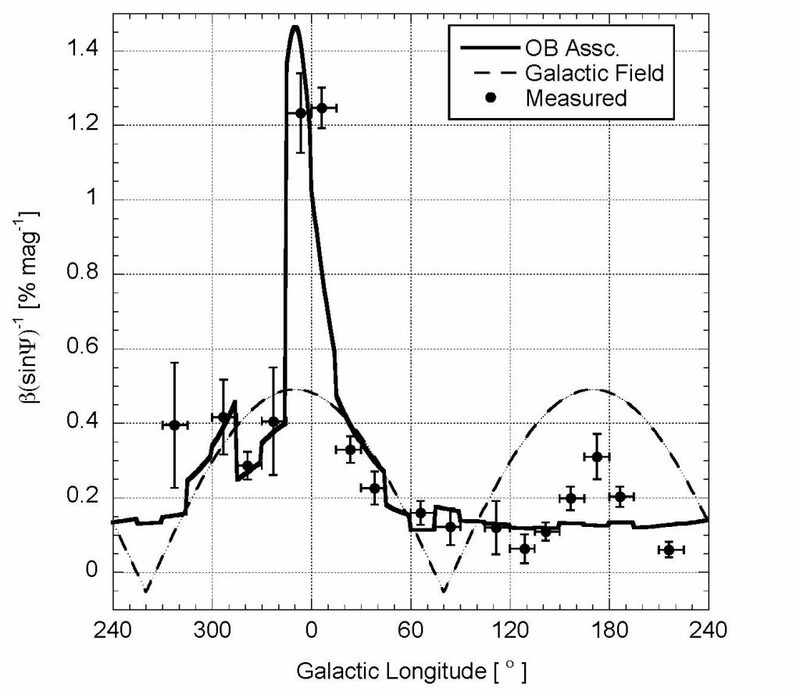 We probed that prediction (and found that it was supported by the observations) using a geometry illustrated here where a star right next to the interstellar cloud dominates the radiation field and we probe the alignment by measuring the polarization towards distance background stars shining through the cloud close to the illuminating stars. John Vaillancourt and I did the equivalent study using far infrared emission polarimetry towards the Becklin-Neugebauer object (and embedded protostar) in Orion and we find the equivalent angle dependence also in this source (Vaillancourt & Andersson, 2015). False alarm probabilities for all OMC-1 data for the 180° component at radii 1.′0–1.′5. The fact that for the 100 and 350μ maps a strong peak is found centered on the BN/KL object indicates that the polarization is correlated on a 180° period, as would be expected from RAT alignment. 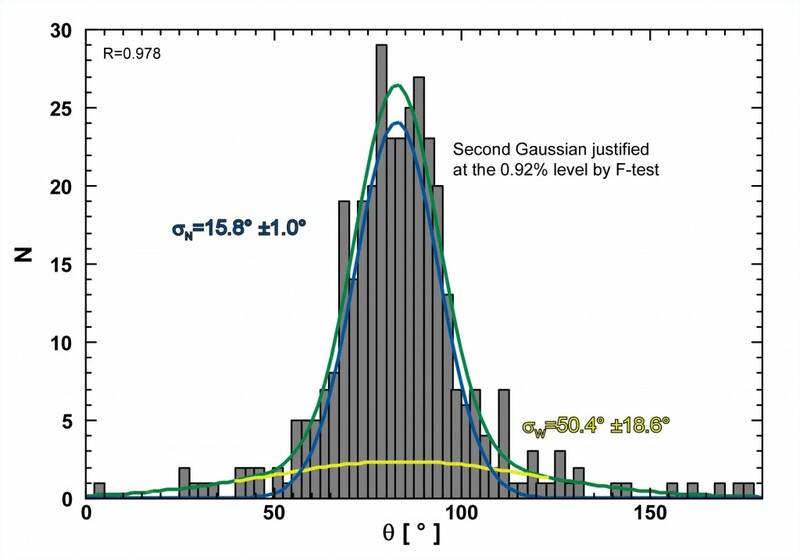 Here’s the paper Steve Potter and I wrote about the polarization towards the Southern Coalsack (Andersson & Potter 2005), arguing, based on a Davis-Chandrasekhar-Fermi analysis, that there is a very strong magnetic field associated with the cloud. The distribution of position angles for the polarization seen towards the Southern Coalsack separates into two components; a narrower one due to the polarization in the Coalsack itself and a broader one from polarization in the wall of the “Local Bubble”. 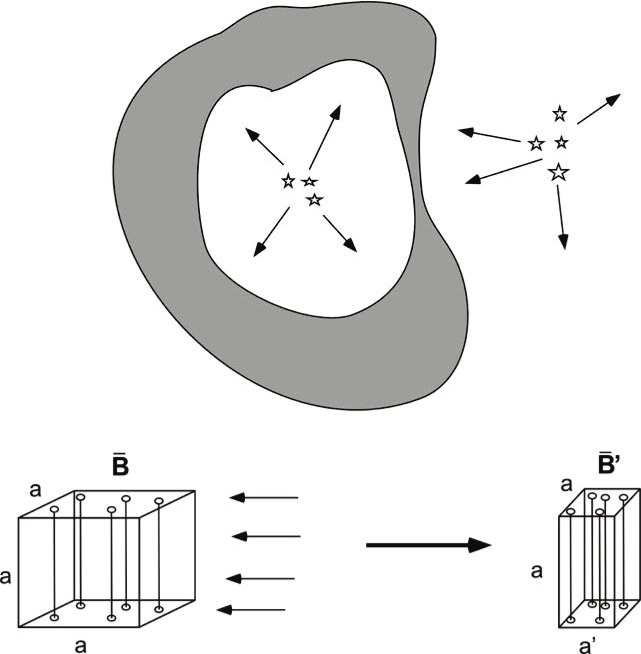 The width of these distributions can be used to derive the strength of the magnetic field in the material. 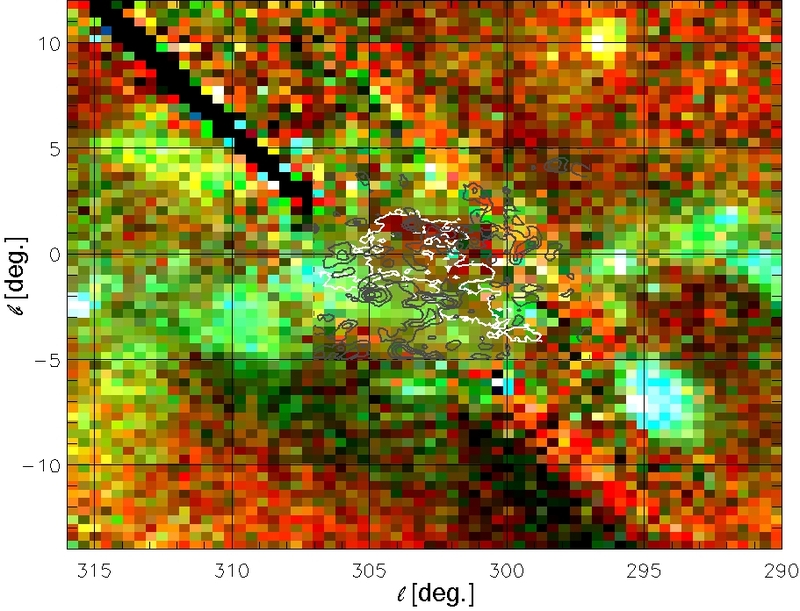 Based on FUSE, ultraviolet and ROSAT, X-ray data, we showed that the Southern Coalsack, is surrounded by a hot, x-ray emitting envelope (Andersson et al. 2004). This is likely due to the fact that the “Upper Centaurus-Lupus super bubble” overtook the cloud about 1 Myrs ago, compressing and heating the cloud envelope. 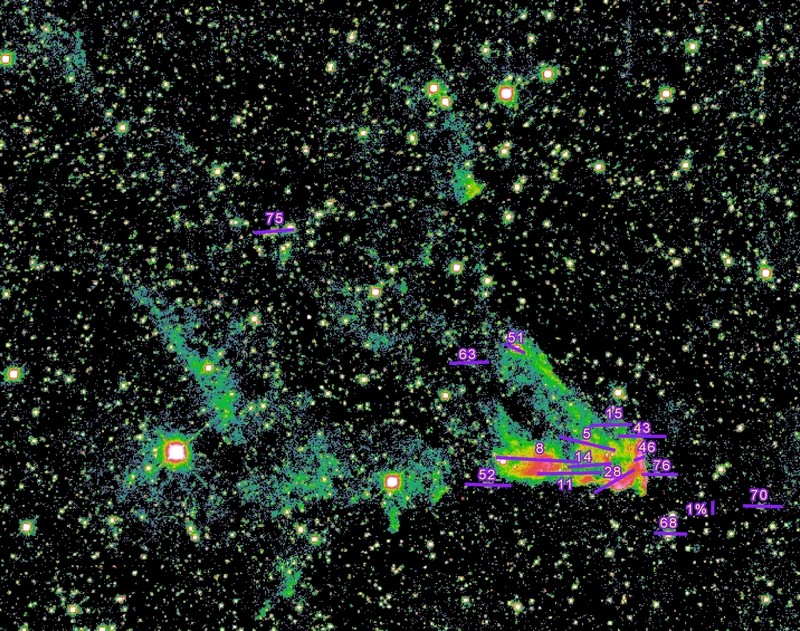 The Southern Coalsack molecular cloud (CO J=1-0 extent shown by white outline) is surrounded by a X-ray emitting envelope traced by the false color image using ROSAT observations (R: 1/4 keV, G: 3/4kEV, B:1.5keV; the black diagonal stripe represents a missing stripe in the all-sky survey). The light gray contours represent synchrotron radiation seen in the radio regime indicating energetic electrons trapped in a strong magnetic field, consistent with our optical polarimetry results. Ilija Medan and I have shown in a new (Jan 2019) paper that the fractional polarization, and therefor the alignment efficiency, is directly controlled by the intensity – and color – of the light impinging on, and aligning, the grains. We did this by probing the variations in the polarization caused by the dust in the wall of the “Local Bubble”. Using the Davis-Chandrasekhar-Fermi method, we were also able to show that the magnetic field strength varies around the wall of the Local Bubble in a way that can be understood by assuming that the wall is being compressed by the countervailing flows from inside the Local Bubble and from surrounding star groups. The Local Bubble wall is driven (outward) by the winds and radiation pressure from the stars and supernovae inside the bubble – stars that were likely formed together with the Sun). 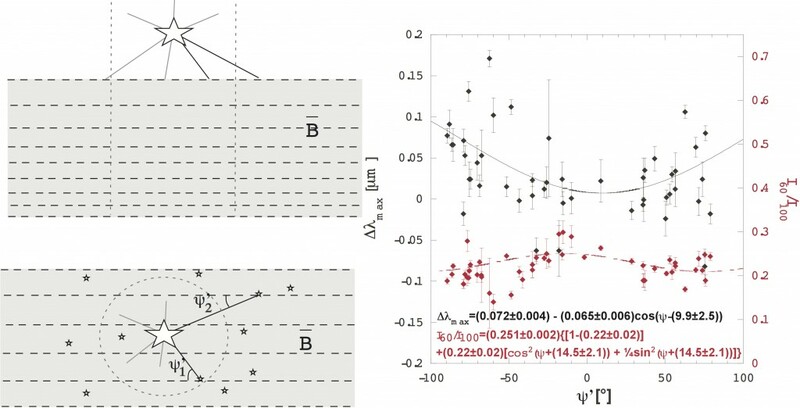 The magnetic field strength variations we see in the Local Bubble polarimetry are likely due to the compression of the wall as this flow encounters the opposing force of the equivalent winds from and around other near-by star clusters and associations. Since the magnetic field is frozen in to the gas (in the cross-field direction) as the medium is compacted the magnetic pressure rises. Because the gas could “leak out” along the field lines it is not as clear what the response of the gas pressure should be. This requires additions observations to test. A distinct circular feature – the “IRAS ring” – is seen in the gray-scale 100μ IRAS image of the Perseus cloud (left). At the center of this ring is the O9.5-B0 V star HD 278942. 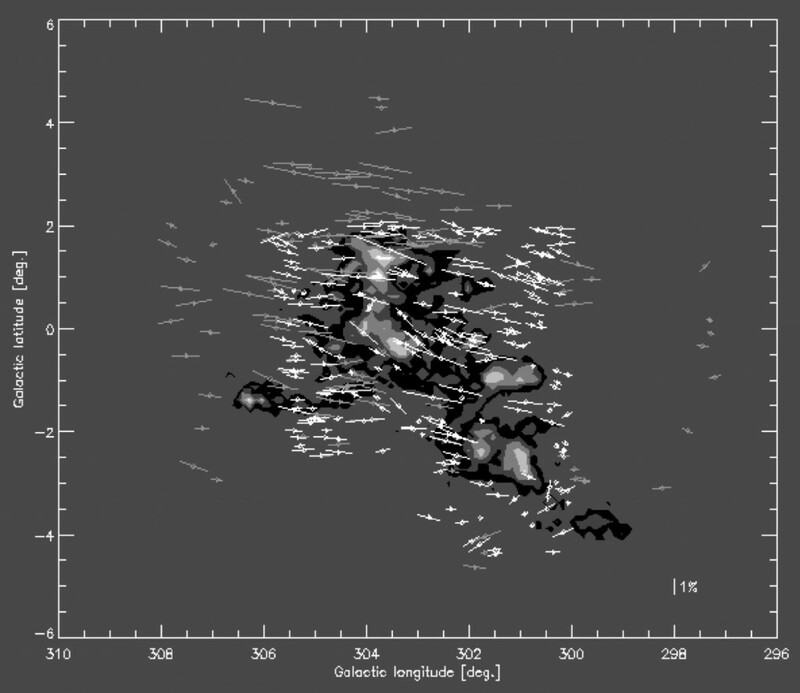 A single channel H I image of the cloud shows a distinct “pincer” to the North-West (upper right) of the location of the star (middle). To the right I show a cartoon of the region: A hot star is blowing a ionized bubble in the cloud. The rim of this bubble shows up as hotter, denser dust giving ride to the “IRAS ring”. The bubble has reached and broken through the edge of the cloud in the NW and as hot, ionized gas is venting the neutral shell is being swept aside, giving rise to the “pincer”. 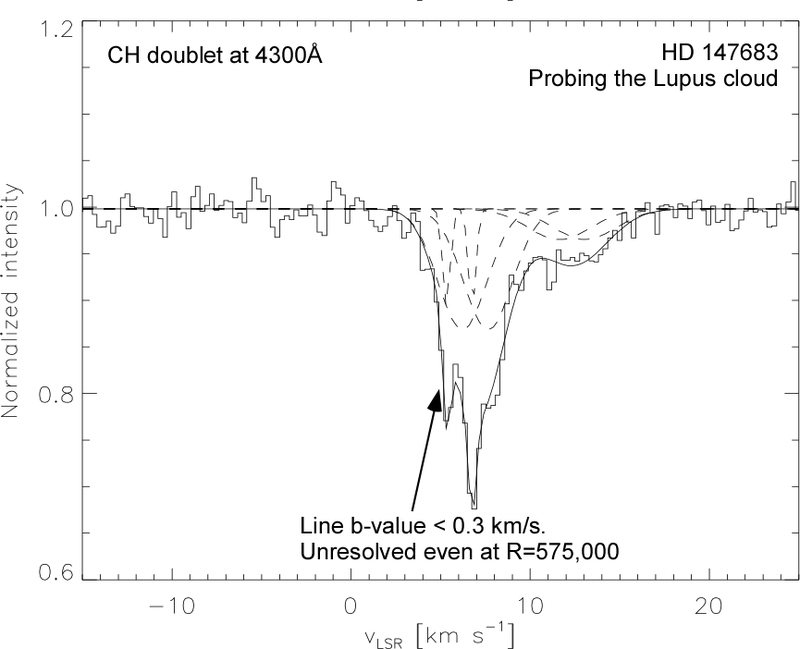 An – by optical telescopes/instrument – extremely high resolution spectrum of the CH radical in the interstellar gas towards HD147683 shows a complex velocity structure with very narrow components. The UHRF instrument at the AAO in Australia could (uniquely) reach the velocity resolution commonly done at radio and mm-wave wavelengths. Having started out as a radio and mm-wave astronomer it took me a while to internalize that the velocity resolution that you “automatically” get from such observations (typically 0.5 km/s or better) is not “possible” in optical astronomy, where 5 km/s (resolving power R=60,000) is considered high spectral resolution. One of my wishes is that some day (soon) we will have a spectrograph with R>300,000 on an optical telescope large enough to allow a dense enough sampling of background stars that we can directly compare the velocity structure and its variation across clouds in species we observe in the radio/mm-wave (e.g. CO, HCO+) with those we trace with optical telescopes (CH, CH+, K I, C2, etc.). The German PEPSI instrument on the Large Binocular Telescope might do that. Though, that’s a private observatory so if you’re not affiliated with one of the member universities it will be really hard to get time there. 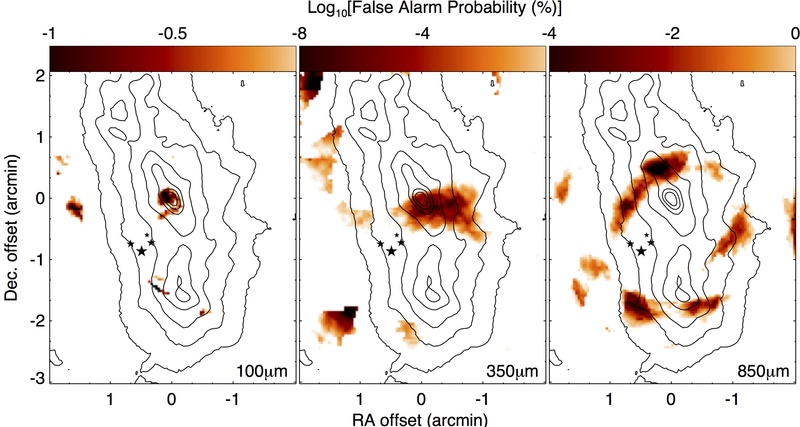 In a paper which is almost ready to submit, John Vaillancourt, myself and our collaborators use observations form the Kast prectrograph at Lick Observatory to show that the relationship between λmax and AV bifurcates at around the depth into the cloud where ices form. We interpret this as being due to grain growth in those lines of sight that probe denser clumps of gas (on the “upper branch”). 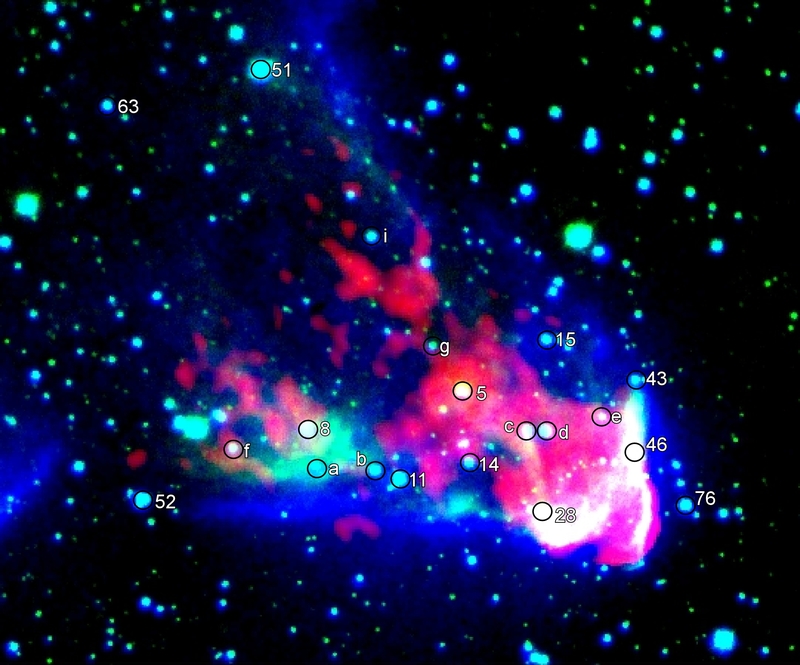 We observed a large number of stars behind the Taurus molecular cloud with the Kast spectro-polarimeter at Lick Observatory and the TURPOL instrument at the Nordic Optical Telescope. The results show that the λmax vs. AV relation seen earlier persist up to about AV~4 mag. 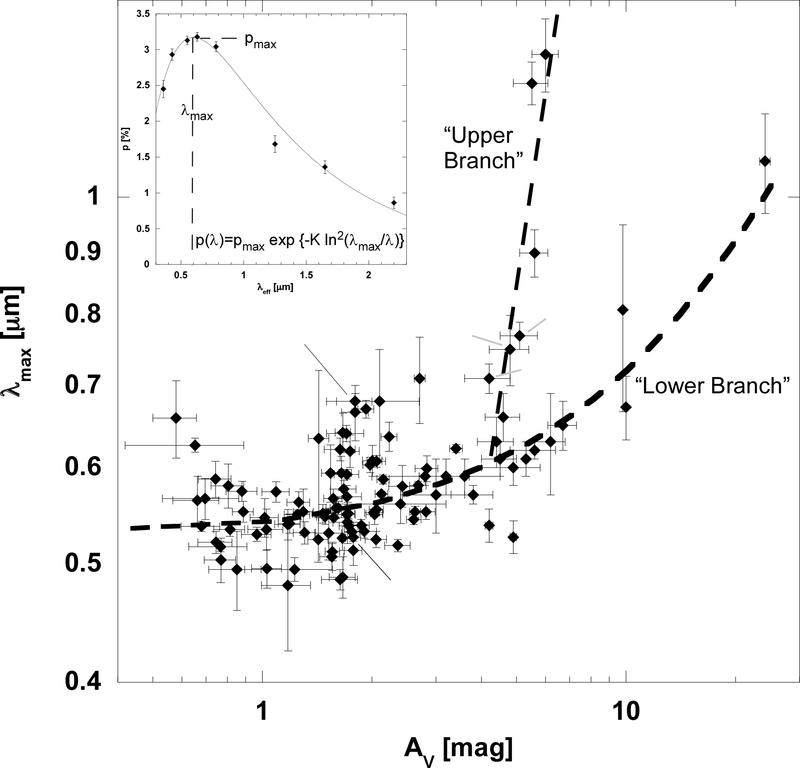 Beyond that the relationship bifurcates into a “lower branch” extending the relation at lower extinctions, and an “upper branch” with a power-law rise in λmax. We interpret the “upper branch” as being due to grain growth in dense clumps intercepted by these lines of sight. A false-color image of IC 63 with the Red channel being HCO+ (J=1-0) from the CARMA observatory, the Green channel is the H2 1-0 S(1) fluorescence observed with the Canada-France-Hawaii telescope’s “WIRCam” instrument and Blue channel is the red band of the Digital Sky Survey, which traces Hα emission and therefore ionized gas. The filled circles show the location of our polarization targets. but unfortunately it’s not available in electronic form. A non-typeset manuscript version is here’s. “Star Formation, Magnetic Fields, and Diffuse Matter in the Galaxy: A Conference Honoring the Contributions of Richard Crutcher & Carl Heiles”, held May 23-26, 2016, in Madison, WI. The talk was recorded and posted to YouTube by the organizers (link through the title). 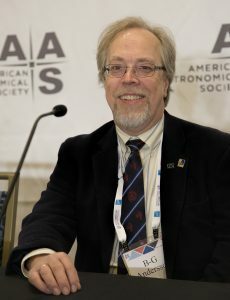 I was part of a news briefing on Jan 9 2018, at the AAS meeting in Washington D.C., about the SOFIA/HAWC+ results presented at the meeting. My research assistant, Ilija Medan, and I were presenting a poster showing how the light from the near-by OB associations (primarily the Upper Scorpio and Upper Centaurus-Lupus ones) strongly affect the grain alignment efficiency in the wall of the local bubble. Dust Grain Alignment in the Interstellar Medium.